At Cult & Boutique Wine Management we pride ourselves in recommending some of the most exclusive, highly sought after wines in the world. Alongside fine wine stalwarts such as Bordeaux First Growth, Burgundy and Pomerol, we have also worked with numerous 100 point scored wines produced in quantities sometimes as low as only 150 cases. As you would probably be aware, Robert Parker’s Wine Advocate team and most leading wine critics include what is called a ‘Drinking Window’ in their tasting notes. This is usually a range indicating when you could potentially approach the wine for consumption and also when the critic feels the wine will have reached the end of it’s optimum lifespan. Drinking windows are usually updated when a wine is re-tasted and it is not uncommon to see them extended – sometimes quite dramatically – when a critic realises the wine has a much broader lifespan than suggested when sampled in its youth. But what happens when the drinking window ends? If a wine has a good enough reputation and is from a high quality vintage it has the potential to continue showing capital growth and be bought and sold on the secondary market as a collectable. If a wine is fortunate enough to cross over from consumable to collectable then it has the potential to command interest from buyers for decades upon decades. With this in mind we planned a limited run of products aimed specifically at bridging the gap between the consumable and collectable markets. A small number of Clients recently had the opportunity to take part in a new bespoke venture produced exclusively for Cult & Boutique. Working in collaboration with Gower based craftsman John Evans, we commissioned a series of solid oak, handcrafted cases produced to hold a selection of the world’s finest wines. 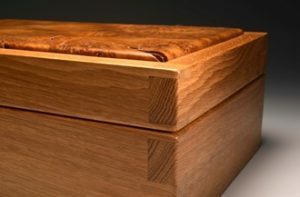 John produces handmade ring, watch, and jewellery boxes. 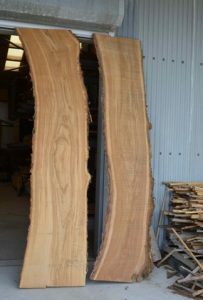 Working in carefully selected hardwoods he crafts a limited number of individual pieces from rare and unusual timber. There were five different cases in the first bespoke series, each produced in miniscule quantities and featuring wines carefully selected to add value and desirability to each case in years to come. There are cases with multiple vintages of the same wine, or multiple wines from the same vintage but every wine in each case has been awarded a perfect 100 point score from Robert Parker or his Wine Advocate team of critics. The wines are matured in oak barrels prior to bottling, so we thought it fitting to return them to oak to continue the maturation process. And in the same way that you can trace the provenance of a fine wine to a specific vineyard, we have the specific location of the tree felled to produce the cases. 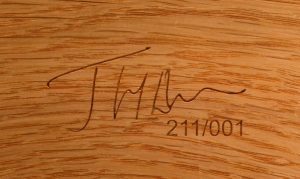 Each hand crafted case is a work of art in it’s own right and is individually numbered and issued with it’s own Certificate of Authenticity by John Evans himself. Constructed using through dovetail joints topped with oak boards cut from a single oak tree and featuring hand carved oak hinges, the interior is lined in dark brown suede and the exterior finished with two coats of hard wax penetrating oil, followed by a natural carnuba wax. No expense has been spared in order to highlight the very special nature of this project. The oak tree used had already reached the end of its natural life, so the more green minded amongst you would take comfort in knowing that a healthy tree was not culled to make this project a reality! Each Client that purchased a case from the John Evans Series will be sent photographs of the cases being manufactured. The wines will be inserted at London City Bond’s Hillington bonded warehouse by Cult & Boutique staff. This will ensure that the in-bond status of the wines will remain intact but also that adequate care is taken to preserve the condition of the bottles and labels. 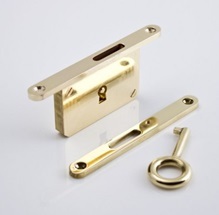 A key will be stored with each case at LCB, another at the Cult & Boutique offices in Richmond-upon-Thames and a third is issued to the Client. As an example, one of the cases we offered featured a series of vintages from Chateau Lafite Rothschild. At the time of writing the Chateau has only three 100 point scored vintages – 2003, 1996 & 1986 – and all three are brought together to make one of the most collectable cases of wine in the world. Having the opportunity to offer two bottles from each of these legendary vintages in one purchase, housed in a bespoke case manufactured to match the lifespan of the wine gives us the potential to access both the consumable and collectable markets directly. We do plan to commission further bespoke products, your Portfolio Manager will contact you with details but please bear in mind that due to the bespoke nature of the products they are produced in limited quantities and are sold on a first come, first served basis. If you have purchased a bespoke product from us you will be our first point of contact when new products are launched and you will be offered first refusal.